WhatsApp, one of the giant Messaging Platform is being used by billions of people across the world. This instant Messaging app has gained much fame due to its innovative features and many user-friendly features like WhatApp voice calling, video calling, transfer unlimited images, video and audio messages. 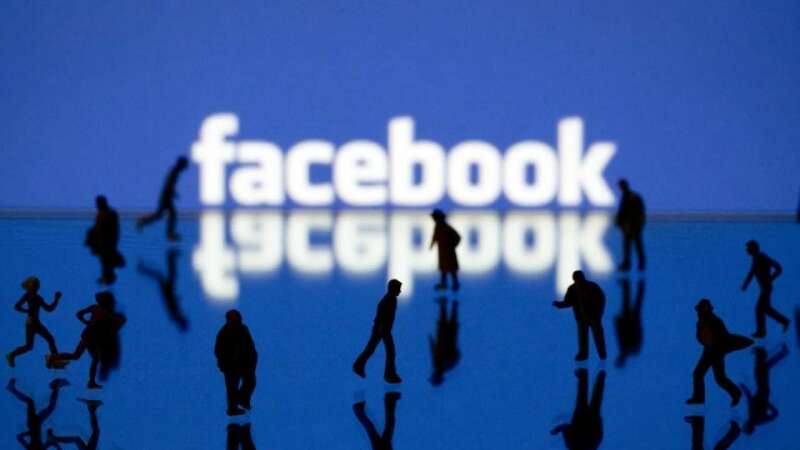 Recently, a survey has been conducted among Indians in which they found that WhatsApp and Facebook are the most popular applications used by the Indians. But, one major problem that most of the WhatsApp users have been encountering is Last Seen option. In fact, it might not be a limitation of WhatsApp but, most of the people don’t wish to have this feature on this popular messaging platform as it reveals the time of Last Seen message by showing two blue ticks alongside. However, there are many tricks to see messages without getting blue ticks using some applications. One such application namely Shh WhatsApp is available on the Google Play Store that lets you see what your friend has a texted you on WhatsApp without notifying them that you have read the message with the Last Seen option. Here is a detailed tutorial that guides you on how to use Shh WhatsApp app on your smartphone to read messages without the need of opening the app. Check it out!! Shh WhatsApp is an android app that enables you to read WhatsApp messages without the need of explicitly opening original WhatsApp app. It is an Incognito of WhatsApp that hides your last seen of your WhatsApp message and it can hide you from showing that you’re online so that you can see the messages without informing the messengers that you read their messages. The sender of the message assumes that you’ve not yet seen their message. Shh WhatsApp is the best way to read WhatsApp messages without opening the original WhatsApp app. Most of the people are considerably searching for an app like this – to hide WhatsApp ‘message seen’ with reading the app as well. Through this app, your message won’t get a double tick with blue colour so that your problem can be solved. Use Shh WhatsApp app on your mobile, see/read your friends messages on WhatsApp without appearing online. 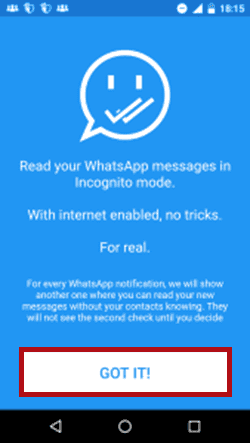 Shh- WhatsApp Incognito is an android application which is available on the Google Play Store. In order to use this application, you need to have internet connection enabled. This application works only with the official WhatsApp application and you can’t run this app with GBWhatsApp because it comes with the separate package name. There are no ban issues in this application so you can use this application without any flaws. You can hide the last seen and blue ticks from users and as well as from the group conversation. You need not open the original WhatsApp app to read your WhatsApp messages. Your friend doesn’t get any notifying info whether you’ve read his message or not. You can read WhatsApp messages without coming online but, you need the internet connection to use this app. You can escape from WhatsApp double blue ticks and hide Last Seen option. Shh WhatsApp is absolutely free and there is no need of the hectic sign-up procedure. Here is a step-by-step procedure to use Shh WhatsApp Incognito app on your Android device. Just follow these simple steps in order to hide your Last Seen and blue ticks from your friends on original WhatsApp app. 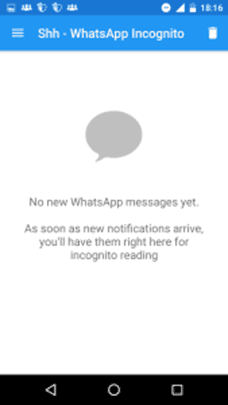 Initially, Download the Shh WhatsApp Incognito Android app. Once the app gets downloaded on your device, open the application and just hit on Got it. Once after allowing the notification control, simply click on I understand. 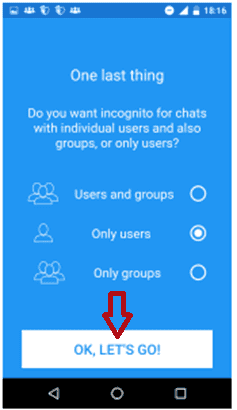 Select the privacy to whom you want incognito for individual chats, groups, or both. A screen will be displayed showing your messages. Whenever your friend sends you a message, you will directly receive the message on WhatsApp incognito so that you need to look into your original WhatsApp app. Through this Android application, you can easily read the messages on your WhatsApp without appearing online and hiding your last seen. Your friend won’t be notified that you are reading their messages. You can read the message without appearing online. The registration process is not required. It is not possible for you to reply to the messages which you got on original WhatsApp from WhatsApp incognito app. You cannot download media from WhatsApp incognito Android app. Hope this tutorial guides you in the best way to use Shh WhatsApp application on your Android device like the incognito of WhatsApp. 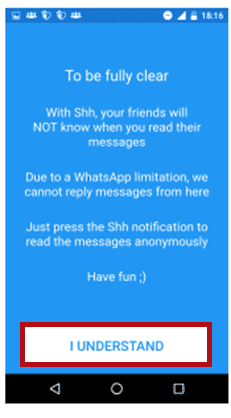 You can now see or read WhatsApp messages of your friends in individual chats and group messages directly on Shh WhatsApp app without opening the original WhatsApp messaging application. Not geting this apk on google play..